Ryson International manufactures high quality Spiral Conveyors, designed for low maintenance and long life. All Ryson Spiral Conveyors are shop tested prior to shipment, but depend on proper spiral integration with the overall conveyor system for optimal performance. Failure to follow these guidelines will adversely affect spiral performance, longevity and may also void the warranty. For more detailed information on proper spiral integration, consult the matching section in the manual provided with your spiral. The controls must be designed to prevent unintended accumulation and prevent product back-ups in the spiral. The controls should be set up in a cascading control method. The in feed conveyor should not start until the spiral is running at full speed. The spiral must stop anytime the out feed conveyor is full or stopped. We recommend the use of a photo-eye to detect when the out feed conveyor is full, thereby preventing loads from backing up into the spiral. 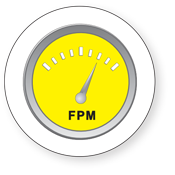 The speeds of the in-feed, spiral and out-feed conveyors must be matched. Max. speed 200 fpm. A speed differential between these conveyors will lead to premature wear of the friction inserts and the chain assembly. 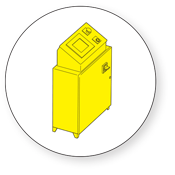 A VFD (variable frequency drive) is required for the proper operation of the spiral. The spiral controls must utilize an acceleration of a minimum 3-5 sec. Longer ramp-up may be needed for taller spirals and heavy loads. The spiral controls must utilize a deceleration of a minimum 3 sec. There must be a gap between the loads when they enter the spiral. The minimum gap should be ¼ of the product length, but a larger gap may be required for spirals with heavy loads to prevent spiral overloading. The spiral cannot be used to pull a gap between loads. The loads must be powered in and out of the spiral. The use of gravity conveyors is not recommended as they do not assure a proper gap between loads. The in-feed conveyor should be 1/8” to 1/4 higher than the spiral. 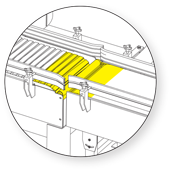 The out-feed conveyor should be 1/8” to 1/4 lower than the spiral. The transition rollers on the Ryson Spiral are independently adjustable at the in-feed and out-feed. Two proximity sensors are utilized on the Ryson Spiral to monitor faults associated with a slack chain or a motor over-torque condition. These proximity sensors must be wired as inputs to the control PLC and programmed as fail-safe devices. Loss of a signal is a fault and the PLC program should immediately (no time delays) shut down the spiral. These faults also need to be programmed as latching manual reset faults which require an operator to reset the controls before the spiral can be re-started. Sensors must be hooked up according to the supplied vendor schematics as they can be damaged if hooked up improperly. 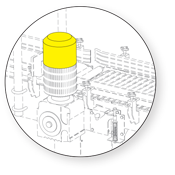 The following are the Turck sensor schematics (below) which is the Ryson standard. Most spiral applications do not require a brake. For taller spirals with heavy loads, a brake is used to prevent rollbacks and drifting when the spiral is stopped. The brake must be powered with a dedicated power source separate from the motor. The motor is powered by the VFD and the motor voltage is ramped-up at start-up, but is not sufficient to fully release the brake. 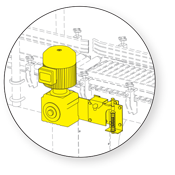 The brake must be released (powered) before the motor is started and set (de-energized) after the motor has come to a complete stop. Brake coils from SEW Eurodrive are available in different voltages. Please consult the manual supplied with your spiral for the proper brake voltage. An automatic chain tensioning device has been provided to assure that the chain stays in tension at all times. Operation of the spiral with insufficient chain tension will cause the spiral to malfunction and have premature wear. The tensioner bar position must operate at an angle between 0º (horizontal) and 10º. The compressed spring should measure between 5 and 6-1/2 inches. The tensioner flag should operate between the green and red markers. The slack chain proximity sensor should be adjusted so that the spiral shuts down if the tensioning bar falls below 0º (approximately 2” from the top of the flag to the bottom of the proximity sensor face). 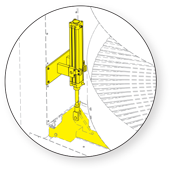 Air cylinders are used instead of the standard spring tensioning device on very tall spirals and with heavy loads or spirals supplied with the reversible option. All air cylinders will have a low air pressure switch, which is used to monitor the supply air and should be hooked up as a N.O. (normally open) device and programmed as fail-safe to shut down the spiral with a latching, manual reset fault. Non-reversible spirals will have one regulator which should be set to 10-15 PSI for proper tension. Reversible Spirals will have a 4-way solenoid valve (24V DC or 110v ac), a shuttle valve and two regulators. The forward (up) direction regulator is to be plumbed to the N.C. (normally closed) porting of the 4-way solenoid valve and the forward regulator set to 10-15 psi. The reverse (down) regulator is to be plumbed to the N.O. (normally open) port of the 4-way solenoid valve and the reverse regulator set to 15-20 psi. The reverse direction of the spiral should be at slow speed, not to exceed 60 fpm. The drive motor is mounted on a torque arm bracket with a spring assembly. The spring applies a torque resistance which can be adjusted to the desired torque limit. The torque assembly will pivot when torque exceeds a pre-set limit set by the amount of spring compression. The torque resistance should be set for maximum protection without impeding regular operation. The proximity sensor can also be adjusted vertically and horizontally for more or less torque sensitivity. This is an abbreviated list. Please refer to the maintenance manual for more details. The Ryson service department is always available to assist with installation and service questions. Feel free to call 757.898.1530 or e-mail service@ryson.com with questions. Design tools are available on our integrator webpage which includes detailed Integration instructions and CAD blocks for all our standard models. You can also obtain specific CAD blocks or design assistance by calling (757)-898-1530 or e-mailing the request to sales@ryson.com. 3D AutoCAD drawings for specific projects are available upon request.